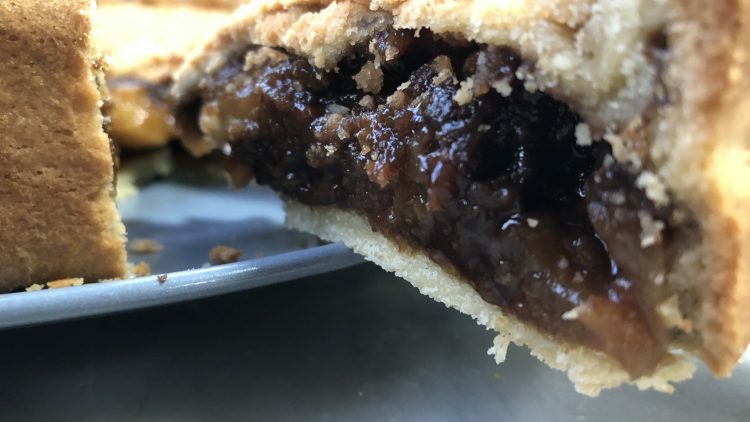 A lovely light Christmas Pudding Pie, just perfect after Christmas and makes the most of any left over Christmas pudding, ensuring nothing is wast-ed. Add the egg and water and mix until a smooth dough has formed. Cut 1/4 of the pastry off the chilled dough and set aside for the pie lid . Grease a 10 inch pie mould and place on an oven proof tray. Roll out the 3/4 of the pastry dough as thin as possible and line the pie mould making sure you have some over lap on the edges. Add the apples and water to a pan and cook over a medium heat for 5 minutes or until slightly softened. Crumble in the left over Christmas Pudding and stir to combine then add in the lemon juice. Place the mixture into the lined pie mould and set aside. Roll out the remaining 1/4 of the pastry and place on top to form the pie lid, crimp the edges to together to seal the bottom and top pastry together.